As official timekeeper of the Bocuse d’Or 2009 competition in Lyon, Blancpain is honoured to be associating its name with the best-known international cuisine contest in the international gourmet world. The quest for excellence, inimitable know-how, precise gestures and meticulous hand-crafted work are a set of values that the Manufacture in Le Brassus proudly shares with the art of gastronomy. Blancpain thereby brilliantly celebrates its passion for this world imbued with noble distinction. The Bocuse d’Or 2009 is held as part of the 14th world hotel, catering and food trade show (SIRHA) at the Lyon Euroexpo exhibition centre on January 27th and 28th 2009. 24 up-andcoming chefs from around the world will be defending their national colours in front of rows of avid fans. They are rising to the challenge of cooking to perfection a set of dishes that are submitted to the demanding taste-buds of 24 famous chefs. Competitors have exactly five and a half hours to vie with each other on the themes of Aberdeen Angus Scottish Beef and Norwegian Sea Products. The time allotted to candidates is scrupulously measured by the famous Flyback Chronographs from Blancpain, official timekeeper for the competition. For this 21st edition, the Swiss candidate, Stéphane Decotterd from Le Pont de Brent restaurant near Montreux, is representing Swiss gourmet know-how with great talent. 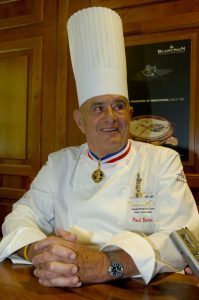 The Head Chef Gérard Rabaey won the final of the Swiss selection round in Bern last April, thereby earning a much-coveted place in the Bocuse d’Or 2009. Stéphane Decotterd is also supported by the president of the Swiss delegation, Philippe Rochat – a long-time friend of Blancpain and a worthy ambassador of Swiss gourmet cuisine. As official timekeeper of the contest, Blancpain is delighted to be accompanying the 24 participants as well as the competition jury. 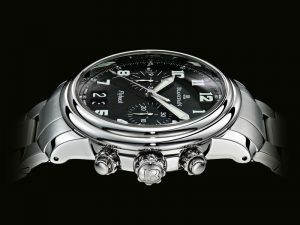 It has the honour of presenting the winner with a Flyback Large Date Chronograph especially hand-engraved for the occasion. This international competition was first launched on January 24th 1987 at the instigation of Paul Bocuse. For over 20 years, it has been bringing together the world’s finest chefs and generations of cooks endowed with a blend of ambition, creativity and talent. Within the small kitchen units open towards the audience and the jury, the future and the reputation of seasoned young chefs is played out for all to see and admire.